Two Southampton fans were reportedly detained by police after yesterday’s Premier League clash against Cardiff City for appearing to mock the death of Emiliano Sala. The Argentine was tragically killed whilst travelling by plane from Nantes to Cardiff after completing a January transfer to the Premier League. According to the Daily Mirror, two fans seemed to be trolling Cardiff with air-plane gestures in the crowd yesterday. This video below has done the rounds on social media, and it seems pretty clear what he’s doing, with Cardiff supporters unsurprisingly sending plenty of abuse back his way. 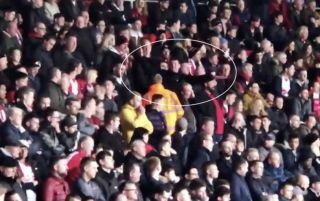 Southampton released a statement condemning this behaviour, with the Saints quoted by the Mirror as saying: ‘Southampton Football Club can confirm that two fans were detained and had their details taken by police during our match against Cardiff City on Saturday. ‘Such behaviour has no place in our game and will not be tolerated at St Mary’s.